The world literally cannot get enough of Kardashian baby stories, so even though there are currently quite a few going on, someone saw fit to manufacture a fake one. But Kim Kardashian shut down rumors about her surrogate on Twitter Wednesday night, so you'll just have to settle for the three kids she already has, I'm afraid. And the one that her sister, Khloé is having. And maybe the one her other sister, Kylie, is having. And the three her sister, Kourtney has, and the one her brother, Rob, has. Sorry if that's not enough. It was only nine days after Kardashian and her husband, Kanye West, welcomed their third child — a daughter, Chicago West — that the gossip sites started buzzing with the story that she'd already asked the surrogate who carried Chicago to carry yet another child for the couple, which is pretty ridiculous, if you ask me. Even if the couple did want another kid, you'd think they'd at least have the courtesy to wait until the poor woman stopped leaking bodily fluids before asking her to go though all of that again. I don't care how much they paid her; carrying a baby is hard. Well, according to Kardashian herself, that claim is false. Several outlets published similar stories on Wednesday, with most citing People magazine's original claim, attributed to an anonymous source: "Even before Chicago was born, Kim was talking about asking the surrogate to carry her next baby." Us Weekly also published a similar claim, also from an unnamed source: "They asked the surrogate if she'd be willing to have another child for them if they decided to do it." Even if both of those claims are true, thinking about asking someone to consider doing something that you may want them to do at some point in the future is not the same thing as throwing another embryo in the oven straightaway, so let's not pretend that it is. North West was born on June 15, 2013, and Saint was born Dec. 5, 2015. Us also reported that all three children were delivered by the same doctor, and Chicago's parents were in the hospital room when she arrived. 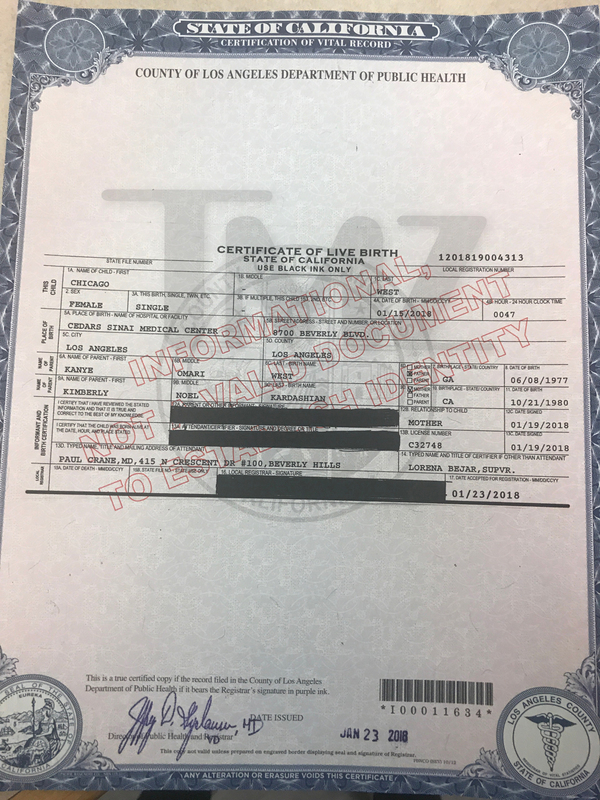 According to a birth certificate obtained by TMZ, she weighed 7 pounds 6 ounces, and like her siblings, she has no middle name, so if they're not into the unique monikers bestowed upon them, there's unfortunately no backup. Fans who were really hoping for more babies in the family won't have to wait too long, though; Khloé Kardashian is expecting her first child with her boyfriend, Cleveland Cavaliers player Tristan Thompson. The reality star revealed that she was six months along in late December, so expect the next birth announcement to come in late March or early April. It's also possible that we might hear about another baby even sooner; Kylie Jenner is also rumored to be pregnant, and due in early February, according to E! News. She's yet to confirm the pregnancy, but nobody in the family has explicitly called it "fake news," either, so don't count her out just yet.